Well my friends, it's that time of year again. We are off on our yearly trip to Arizona in order to escape the cold Canadian winters. 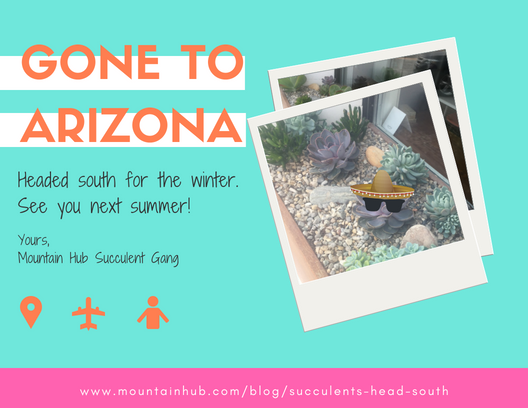 We are in for sunnier skies, warmer temperatures and a reunion with the rest of our succulent brood. We have enjoyed lighting up so many people's lives with our presence out front of the Mountain Hub. When Megan first invited us to live in the front planters of the Mountain Hub we were a tad nervous. What would people think? Us, the rare succulent that yearns for the sun and dry climate, residing in a northern Canadian Mountain town? Would people accept us? It's safe to say that it was the perfect home. And most of us made it through the summer. It's true, we are a man down. Frank, we will miss your dry and prickly sense of humour. RIP. But all in all, one casualty is a small price to pay for all the lives we touched. And all the lives that touched us. Literally. We hope that during our time in Invermere we lit up your life a little bit. And hope to bring awareness that yes, we are real plants. Older PostDedicated Desks Now Available!